Seminyak Private Villas_Villa Sesari, Tucked away in the Jalan Drupadi district of Seminyak is Villa Sesari. A freshly renovated private luxury villa offering its guests full facilities and friendly trained staff. Only 20 minutes drive from Bali's International airport and a 10 minute stroll from the beautiful Seminyak Beach. The area of Seminyak is lined with a great choice of some of Bali’s best fine dining restaurants and bars including, KU DE TA, Warisan and La Lucciola. There are also many casual cafes, along with a fine selection of boutiques and up market shopping. Enter Villa Sesari through oversized Balinese antique gates and across a small fishpond with stepping stones. The villa is surrounded by lush tropical landscaped gardens, frangipani trees, palms and lavish lawns. There are some spectacular oversized stone buddah statues which light up during the evenings and water features which reflect the true Bali. Villa Sesari features three spacious bedrooms all with private en-suite open-air bathrooms, satellite televisions, LCD screens and DVD players, air conditioning and ceiling fans. All bedrooms feature luxurious king sized beds with mosquito nets, and are tastefully decorated, offering large cupboards and views to the garden and swimming pool. The main bedroom has a large ensuite with a beautiful stone bath for you to relax in at the end of the day with the sound of the waterfall beside you and a candle lit lantern for that romantic touch. In the two other bedrooms, the king size beds can be converted into king singles if required. All of the bedrooms have a writing desk with Free WiFi internet. The main living area is conveniently located in the middle of the property surrounded by the beautiful, large free form swimming pool. The living room is open-plan and consists of an impressive 'L' shaped sofa and a fully equipped modern kitchen. There is also a guest bathroom. On the opposite side of the swimming pool is a large bale bengong with cushions to relax on while reading your book or just taking some time out. There is a wooden pool deck on one side of the swimming pool with sun lounges and umbrellas and on the other side is a dining pavilion seating 8-10 people positioned amongst a colourful tropical garden. Villa Sesari is fully staffed with a house manager, housekeepers/butler and cook to meet your every need. Evening security is also provided. Guests staying at Villa Sesari enjoy full facilities including; Telephone for local calls, satellite television, DVD players, wireless internet connection and safe deposit boxes. Bose sound system including an Ipod dock for your use to provide music to suit your mood throughout the villa. Laundry facilities can be arranged by the staff at a small cost to the guests. Spa services may be arranged in the villa on request. Rental rate inclusions: Daily Continental Breakfast, WiFi Internet and butler service. All right reserved. 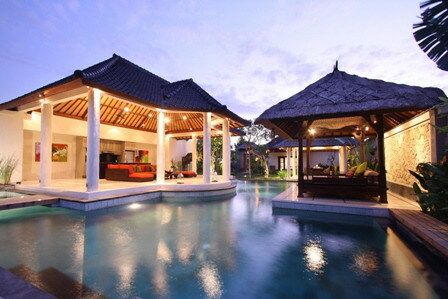 Copyright © 2010 Bali Villas Rental.